I was just about to leave work. In fact, I had stayed substantially late to finish some things up when the phone rang. It was my wife’s best friend Sheri headed to church. She asked if I had left work yet (we all attend the same church). I told her, “You called me on my office phone, what do you think?” We both laughed. 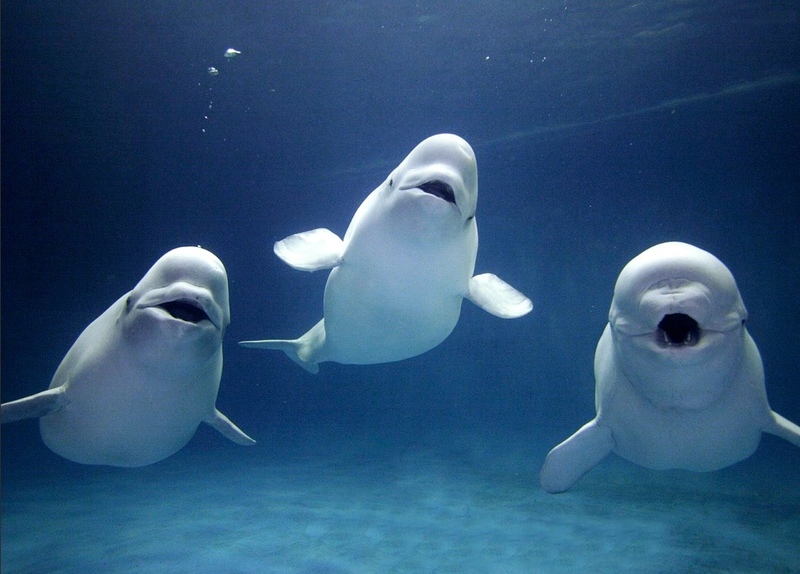 She asked “Can you print something for me and bring it over the Single Parents/Single Adults Service?” I said “sure – what?” “I need a Beluga whale.” I paused. “You need a what? ?” She replied, “I need a picture of a Beluga whale.” I smiled and said okay with kind of a half smirk, and told her that I would meet her at church. So I drove over and met her. Little did I know how God was at work behind the scenes. This place we call “Behind the scenes” is what science is blind to. It is called the Spirit world. Here is where it gets interesting. I would not normally have gone over to the church on a Monday night. So the picture above is what I brought to her – thinking three are better than one, right?? Well, along the way, Sheri has picked up a young lady (former student of mine, and now single mom) that lives with her, along with the young lady’s 5 year old son. I’ll call her Jamie to protect her identity. Well Jamie was coming to church tonight as well. She had just given her life to the Lord a few days ago, and was on fire. Even though she had made a few bad choices – she got back on the horse, and is intending to stay the path with her new found Lord and Savior – Jesus. Well, Jamie decided to bring a friend tonight. Let’s call her Andrea. Andrea is also a single mom, but going through a major depression. She lost her second child at birth a few months ago, and without the Lord, has not been able to see light. Well, tonight I got to meet Andrea. I could tell she was seeking, and Jamie confirmed it. I asked Andrea if she knew the difference between Jesus and religion. She was unsure, so I told her the difference, and shared John 14:6 with her. I told her that Jesus was waiting to give her life, and that if she would pray and ask God to forgive her for going her own way instead of God’s way, and that if she would ask Him to come into her heart – core of her being – that He would also bring life to her. I shared with her Revelation 3:20 where it talks about the fact that Jesus knocks at the door of our heart and that if we let Him in He will feast with us, and have fellowship with us. She prayed with tears and intensity. When we were done, there was a party in heaven in her honor! But it gets better. The worship was starting in the main auditorium, so I told them all to go int and take part in the worship time. I had this nefarious plan to sneakily get the two of them Bibles while they were in the worship time. As I went into the church book store, I asked the lady to show me where the Bibles were, and she asked what kind I wanted. I told her what had just happened, and with tears in her eyes she said “You look over there for Bibles, I will look over here for some other stuff.” I found two Bibles the same – some women’s encouragement type of devotional Bibles – something to get them going. But the lady came back with a CD on grief and loss, and then a special devotional book for mom’s who’ve lost kids, and then another CD on loss as well. I looked at her and gave her a hug. She said “This is on the bookstore. I am gifting it to her.” Have I said how amazing my church is yet?? Anyway, in perfect timing, the worship time was over, and I brought the girls to the bookstore so they could meet this awesome lady and gave them their treasures. The bookstore lady gave them both big hugs. The genuine love kind of hug. Andrea was in tears of joy. She couldn’t believe it when she saw the things in her bag and the love she was experiencing. She had told me earlier how she needed to pull out of her depression so her daughter of 3 years could see how life is supposed to be. So the Lord, in His great mercy, brought her to Him tonight, brought her some great resources and a Bible to get to know Him better with. But it gets better. Their class was going to start any second, so I then sent them to their class they had come to attend. A class called “Embrace Grace” or something like that. Wouldn’t you know that the leader of the class on this particular night decided to step aside, and bring in a friend who had lost a child at birth. She shared how God met her in this very trying time with amazing grace. Never had this leader done this before…but in this particular evening, the Lord led her to this change of teaching this evening. Andrea was beside herself. Who could have planned this night with all of its details to come together like clockwork? Andrea had thought that all of this stuff she was feeling was so abnormal and weird. Therefore, she was weird. Little did she know that she was not alone in these feelings. Nor was she alone in the Lord. God surrounded this young lady with a lot of love this evening. She walked into a church lost, confused, and hurt. She walked out as a found child of God with life, love, purpose, hope, still some hurt – but healing, and a new clarity in her life. I am sure she has questions, but she is now in a great place to grow and heal. Please pray for our new sister in God’s family – Andrea (God knows her real name!) as well as her daughter. And also please pray for Jamie that she would continue to grow in the grace and love of Jesus.